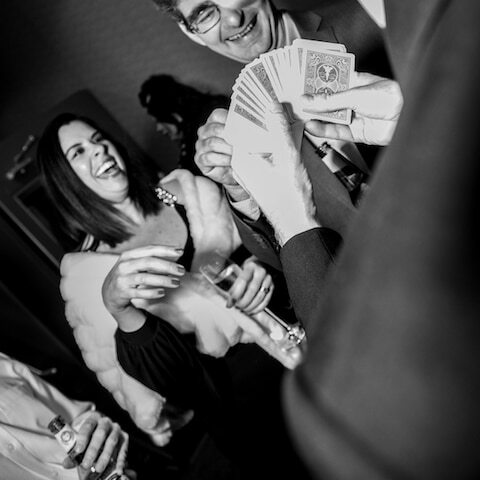 Whether it’s a birthday, an anniversary or just a party for the sake of a party, Darren Delaney is a party magician who will make it one to remember. Parties often take a while to get going, especially if people don’t know each other well. Early in the evening, things don’t get started until people have enough “dutch courage” to get in the party mood. What if you could guarantee an amazing party that starts with a bang and everybody remembers for a long time afterwards? Darren will have your guests talking and laughing from the moment the party starts. He’ll amaze everybody with the kind of close-up magic you usually only see on TV, but right in front of their eyes with no camera tricks! Close-up magic is a great way to get your party off to the right start, and everybody will be talking about the evening for a long while afterwards. Celebrating a birthday or want someone to get some special attention? He’ll make the birthday person the star of the evening with a show-stopping finale. Darren has entertained party guests at exclusive venues including Soho House, The Hurlingham Club, The Roof Gardens, The Groucho Club, Quaglinos and The Caledonian Club. He’s won a bunch of awards and is a two-time finalist in The Magic Circle Close-up Magician of The Year competition. Darren is also an official performer for The Royal Variety Performance Afterparty. To find out how Darren can make your party a magical one, fill in the form below providing as much information as you can. You can also call Darren directly on +44 (0) 7930 379760 or email darren@darrendelaney.co.uk.